As previously discussed, the stock gauges on these trucks are suspect. I think the main culprit is the ICVR, but even though both Dad's truck and Rusty will/are running a solid-state ICVR, I still won't trust the factory gauges. It is so easy to run aftermarket gauges and know that you are seeing reality that it just makes sense. But where to put the aftermarket gauges is the question. Many of these trucks have been running them in a bracket under the dash for years. Dad's truck had an oil pressure gauge below the dash when I got it, and I added a volt meter and temp gauge soon thereafter. But, that puts the gauges quite low and you have to take your eyes off the road to read them. 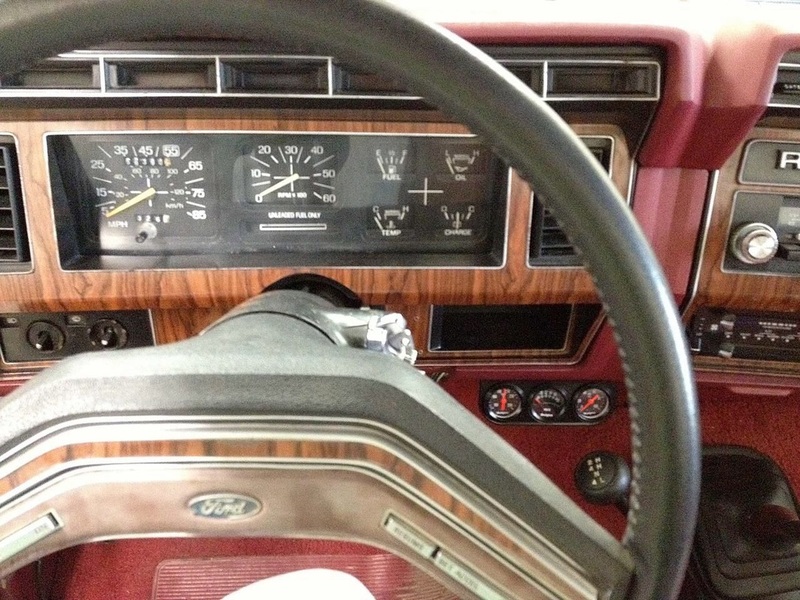 Here's a picture showing the gauges I added to Dad's truck. As you can see, they are just visible when the steering wheel is just in the right position. But, in the above picture, just above and to the left of the aftermarket gauges, you can see what I call the "iPhone pocket". I called it that when I was carrying a 4S as it was a perfect fit in that pocket. But, when I upgraded I discovered that the phone won't fit. So, what to do with that pocket? How about placing the gauges there? Well, after a lot of research I found that only the small gauges, like shown above, will have any chance of fitting, and even then only two will fit. Not to worry, I'm converting the ammeter in Dad's truck to a voltmeter so will only need two - the oil pressure and water temp gauges. Here's a closeup. Obviously it would need to be painted to match the instrument bezel, but it gives you a good idea of what it would look like. I haven't taken this idea any further, but the plans are available if anyone wants them. The dimensions are right as it is just pressed into the pocket in the picture above. It could be 3D printed, but I would have to turn the drawing from 2D into 3D, so it would take some time and effort. Anyway, if anyone is interested let me know via the Contact page.